Whether it's to carry your id, keys, phone or shot glass for you hen party then there is no doubt that hen night lanyards are becoming an increasingly common accessory. Making it the perfect item for customising. Our traditional personalised lanyards a re supplied with a selection of attachments. The most common is the lobster claw. But other variants are available on request. By default we also include a breakaway connector. We believe this accessory is essential for increased safety when wearing anything around the neck. Whether in a workplace or party environment. These personalised lanyards are screen printed. This means that there is a screen charge per colour and a longer lead time together with a minimum order quantity. This is compensated by the option to have several colours on the lanyards. The unit price per lanyard also decreases quite considerably as the quantity increases. 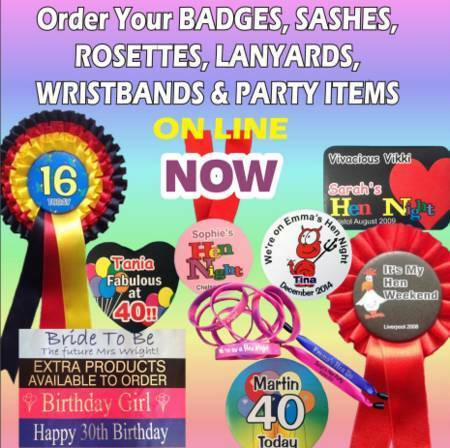 Our ribbon badges are also based on our ribbon lanyards and continue the customisable theme. They comprise a ribbon lanyard which is used in conjunction with our 75mm diameter badge to offer an alternative way of wearing our larger customised badges. This is ideal if you don't want to use the more traditional pin fastener that is normally supplied with our customised badge range of products. The ribbon also draws more attention to the badge whilst it is being worn, so this helps to increase the badge visibility as well as its message. As with our lanyards, these badges are also supplied with a safety breakaway connector. Ribbon badges - providing the convenience of a lanyard with the added advantage of additional customising by incorporating a badge. For additional details of the customising options that are available for our badges, such as including a photograph of the Bride or the Birthday person, colour co-ordinating it to fit in with any particular colours scheme for their event. You could also add the names of the individuals at the event. Please refer to our badge page. 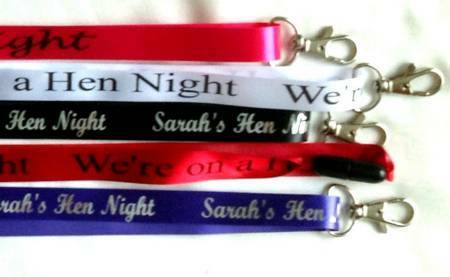 Hen Night Lanyards Badges are a great addition for your hen night. If you cannot manage to order exactly what you require on line then you can always send us an email with your request or fill in our enquiry form and we will send you a quotation and when you are ready to order we can send you a payment link.